We secured the contract for the design and installation of this bespoke kitchen and utility room in Rickmansworth following on from other work carried out within the property. Our client designed the kitchen herself with the help of our kitchen designer. She wanted the ability to tweak/change the design as the build progressed. 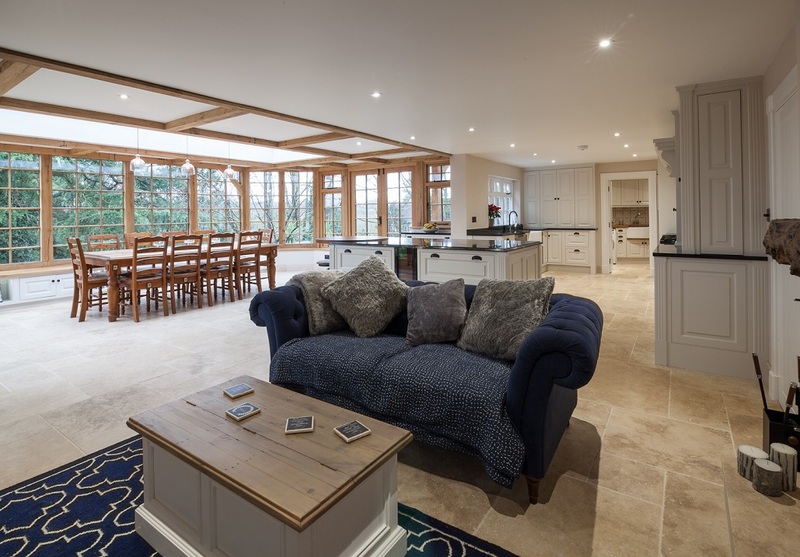 We could understand the need for flexibility to change plans –the space changed considerably with the installation of an oak orangery and bricking up of doorways/enlarging of windows etc. By working closely with the home owner daily we adapted designs and created unique features including: secret cupboards, budding chef spaces and ingenious storage for every day utensils. We factored in wine racks, a small fridge for white wine, low level of installation of microwave for the children to use and much more. 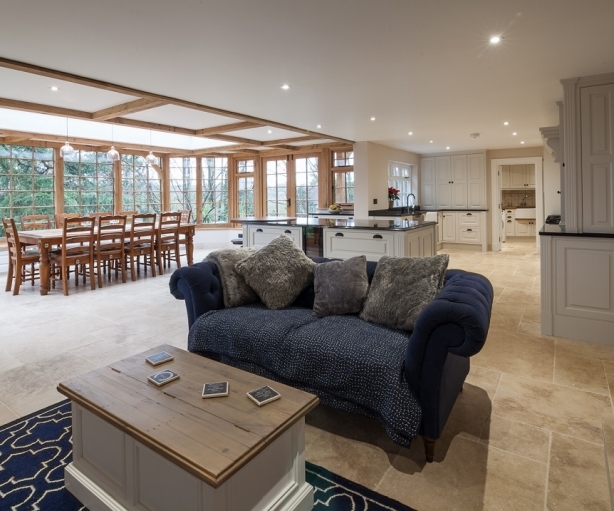 We layed Travatina flooring from Italy and a combination of Iroko and granite work surfaces. We hand-made back lit glass units between the orangery and kitchen to link the rooms to maintain a continuous flow. In the utility area we bricked in the doorway to the garden to provide a more usable space without compromising the light. We hand-made units to mirror the kitchen in their detail, we made laundry units, created cupboard space for neat storage of sports equipment and cleaning materials and more.